The Emergency Department and 999 are for life-threatening emergencies only. You should travel to the Emergency Department if you can. However, if someone is too ill, call 999 for an ambulance. 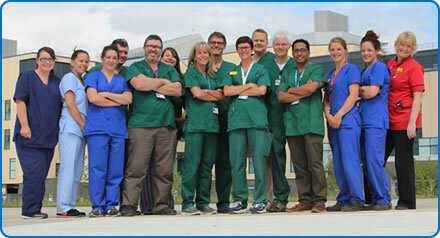 When you arrive at Southmead Emergency Department you will see the Triage Nurse, usually within 15 minutes of arrival. The triage nurse will assess you to ensure you are at no immediate clinical risk. Patients will be prioritised depending on how unwell they are. Doctor – depending on your condition. If the Triage nurse feels you need closer observation you will be transferred to our monitored area – the Emergency Department Observation Unit (EDOU). Our Physiotherapy Practitioners help restore movement and function when someone is affected by injury, illness or disability. They are able to request X-rays, assess, examine and treat traumatic/acute injuries such as minor head, neck or back injuries, limb injuries, broken bones (fractures), dislocations, grazes, wounds and minor burns. Emergency Nurse Practitioners and Advanced Nurse Practitioners can see, examine, treat and discharge patients with minor injuries and minor illnesses. They can also request investigations, such as X-rays. There is also a Minor Injury Unit based inside the Southmead Emergency Department which can treat both children and adults, meaning you may be directed there for treatment. Opening hours: 24 hours a day, seven days a week. Location: Gate 35, Level 0, Brunel building, Southmead Hospital, Southmead Road, Westbury-on-Trym, Bristol, BS10 5NB. Southmead Emergency Department has a dedicated car park accessible from Dorian Way, which works via automatic number plate recognition. Payment by credit card, notes or coins is required before you exit the car park. Emergency Department - our journey to "good"
When you receive care in our Accident & Emergency (A&E) department given the opportunity to give your feedback by answering a simple question about your experience.